The cottage layout is simple, bathroom/laundry and two bedrooms off a long kitchen, dining, living room. The view across the tree tops to the estuary and the Bay of Plenty is outstanding. When there's a sunset you'll see all of it - wonderful light on the water reflecting the colours of the sky. The three beaches within walking distance are Maketu (10 mins away) and Nedwicks beach and Little Waihi both about a 20 mins pleasant walk. Maketu and Little Waihi estuaries are seasonal home to thousands of birds often including a few rarities. NZ dotterel, red and black-billed gulls, white-fronted terns nest on Maketu spit in good numbers. Roydon Downs farm offers bush stream swimming, water slide, glowworms, tracks. 20 mins drive. 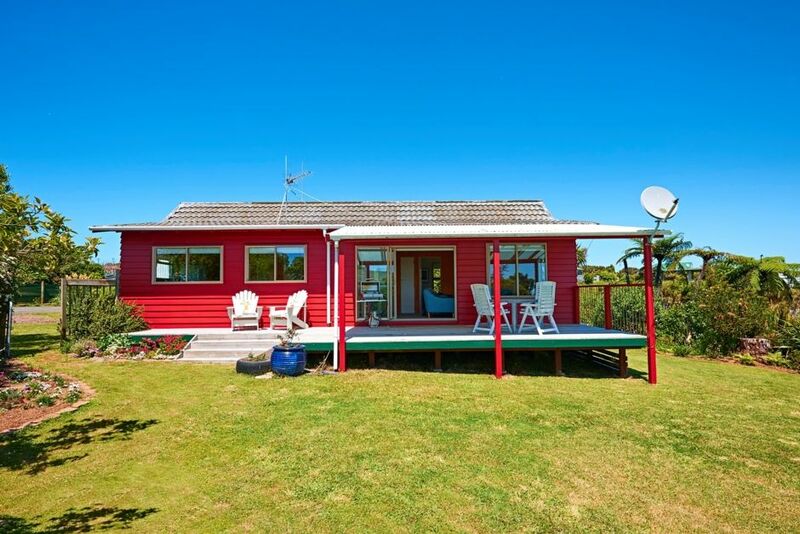 Te Puke offers shopping, coffee shops, a golf course, a swimming pool, library and a good cinema. Nearby cruise ships venues are Comvita (honey) and Kiwi 360 (kiwi fruit). Both offer tours, restaurants, shops. It's 40 mins drive Mt Maunganui (hot pools, The Mount), Tauranga (art gallery, shops). Rotorua is an hour's drive (thermal attractions, Wingspan raptor centre, the extensive Redwoods mountain bike trails, lakes, bush walks). The Kaimai range is laced with tramping tracks. Tour boats leave from Whakatane for the active volcano, White Island. Miranda Shorebird centre is 2 hours drive away. Extra single bed available. Extra cutlery, crockery etc if you have guests. I prefer NZ visitors to use internet banking if possible. Pleasant rolling country for biking. Swing in nearby park. 3 steps up to the back door and to the ranch slider at the deck. We spent two lovely weeks in Larus Cottage. It’s a large, comfortable space and very welcoming. Breezes from the ocean through big open windows meant we stayed cool during the warm nights. Beaches close by & not far to Ohope and Whakatane for day trips. Sheelagh & Julian were welcoming & know lots about the birds and are involved with the Maketu reclamation project. A great place to relax away from everything. Beautiful Cottage with an amazing view. Everything you need for a home away from home! Would definitely book this cottage again! Very cost, homely, tidy,, clean and quiet. Lovely Place for a weekend away. This cottage was great such a nice relaxing place. The cottage was very clean and had every thing we needed. Would highly recommend this place.